Walking into charity: water’s Manhattan headquarters is unlike walking into many other non-profit offices. The decor (all donated and funded by partners) is stylish and understated, the walls lined with giant blow-up portraits of some of the many recipients of the organization’s efforts to bring clean water to underserved communities around the world. But the difference is also reflected in the relentlessly data-driven focus the non-profit brings to its operations: outside Founder and CEO Scott Harrison’s office is a monitor displaying real-time updates of projects all around the world–since 2006, the organization has funded 30,000 projects serving an estimated 8.5 million people around the world. I caught up with him to find out more about innovating in the social impact space, partnering with brands, and his new book ‘Thirst’, a New York Times Bestseller. Afdhel Aziz: Scott, with the giving season now upon us, do you feel like there has been a change in the sentiment amongst Americans about philanthropy given the current political climate? Scott Harrison: We’re living in divisive times right now, and what I’ve been hearing in so many recent conversations is that people are really looking for something they can agree on and believe in. I think now more than ever, everyone agrees on the importance of generosity and compassion. And greater intentionality as to how we can use our resources to end some of the needless suffering that we see in the world. What I love about the work we’re doing at charity: water is that the cause of clean water brings together people of all walks of life. Regardless of your politics or your religious beliefs, we all believe that no human being should die from bad water. Nobody should walk hours to a dirty swamp or muddy river only to bring contaminated water home to their family. Clean water is life’s most basic need. And yet, 663 million people still live without it. The good news is that it’s a problem we know how to solve. Unlike curing cancer, ending global poverty and so many other pressing challenges humans face, when it comes to ending the water crisis, we have the knowledge and the technology to make it a reality. It’s just a matter of getting the right resources to the right people. charity: water does this by raising awareness, and inspiring a global community of generous supporters to join us in funding sustainable, community-owned water projects around the world. We then work with teams of local partners on the ground to implement the projects, making sure they are culturally relevant and sustainable. We’ve funded more than 30,000 water projects to bring clean water to 8.5 million people in 26 countries so far, and are now changing over 4,000 new lives each day with the gift of clean water. Another thing that comes to mind when I think of the shifting sentiment toward charity is the absolute need for transparency. Lack of trust has been an issue for a long time – when I started charity: water 12 years ago, I saw a USA Today poll that said 42% of Americans distrust charities, and an NYU study found 70% of Americans think charities waste their money. My vision with charity: water was to reinvent charity, and we made a promise to send 100% of all public donations straight to the field (made possible by a generous group of families and private donors who cover all operating costs) and to prove every single project. At the time, this was a really radical approach, but I believe that more and more transparency is being seen as a non-negotiable. Donors want to know exactly where their money goes, and rightfully so. Aziz: I agree, this feels like the new normal. You’ve worked with many brand partners, how do you see the role of brands changing towards playing a more positive role? Harrison: As a founder and CEO, I do think all company leaders have a role to play in accelerating social impact. And to play that role in a way that’s authentic to who you are and what your brand’s goals are. I mentioned radical transparency and how crucial it is for nonprofits to be open books. This applies just as much to the for-profit world. It’s been exciting to see transparency being valued more greatly by the business community over the past decade, as consumers across the board demand to know what’s in the food they’re eating and the clothes they’re wearing. And consumers want to support brands that are not just socially responsible in their own business practices but committed to making a larger social impact in their community and the world. I’m encouraged by the growing number of companies that are embracing these types of values. We see the evidence of this shift right here at charity: water, as our portfolio of amazing brand partners, continues to grow each year. It’s been incredible to work with so many companies – brands like Humble Bundle, The Smile Generation, Nautica, Aveda, and many others – whose values align so closely with ours, and to see how passionate they are about helping us achieve our mission. Our community of brand partners has helped us bring clean water to more than one million people. Brands have the ability to make an incredible impact if they chose to make that part of their mission. Aziz: That’s awesome to hear. 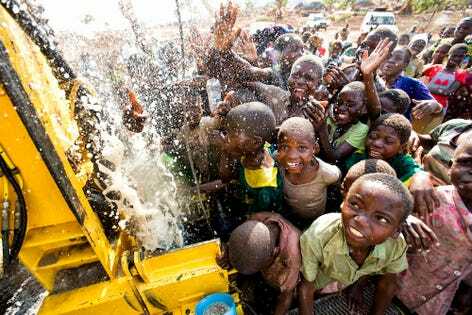 One of the things I’m most impressed by is how charity: water is innovating around data and technology – what are some of the innovations you’re proudest of? Harrison: The best feedback that we get from our supporters is hearing how much it means to them to see exactly where their donations are going. At charity: water, we not only prove every completed water project but also share GPS coordinates and photos along with info about the community it serves. So even though that technology and data aren’t our newest, as it’s something we’ve been using from the very beginning, I am still most proud of the way it really helps our supporters connect with their impact and learn about the area where their dollars are being put to work. A big game-changer for us was winning a $5 million grant from Google.org to develop remote sensor technology on our wells, connecting them to the cloud. Most of the communities that we serve are extremely remote and it can be challenging to know how wells are performing between visits and to make quick repairs if they break down. With the remote sensors, we’re able to monitor hourly flow rates across thousands of communities via data that’s being transmitted from our wells to the cloud, and quickly dispatch mechanics if we spot problems. These sensors provide an added level of accountability and transparency so that donors not only know where their well is but know that it’s still functioning for years to come. We’ve installed over 3,000 sensors on wells in Ethiopia already, and are working on rolling them out more widely and in other locations soon. Aziz: Very interesting. So congratulations on your new book! What has the reaction to your book ‘Thirst’ been? Harrison: Overwhelming! And so positive. I’ve been so humbled by and grateful for all the support the book has received from friends and supporters of the organization. It’s been really fun to read letters from readers, see posts on social media from people all across the country, reading the book or spotting it at the airport or their local bookstore. We were thrilled to be named to the New York Times, Los Angeles Times and USA Today bestseller lists and have enjoyed celebrating those moments. We’re excited to continue the momentum, as 100% of Thirst net proceeds will go to funding water projects. We also built an amazing web experience for readers over at thirstbook.com. Aziz: Very cool. And finally, what’s next for charity: water? Harrison: As we enter our second decade, we want to make a greater impact and continue to grow, but we also want to do it more sustainably. For the first ten years of charity: water, we were laser-focused on growth. Each year we saw more donated birthdays, more money raised, more projects built, and more people getting clean water, but we found that most people were just giving once to charity: water. So we asked ourselves, our donors are clearly interested in supporting our work – how we can we encourage them to do so on an ongoing basis? Recently, we’ve shifted our focus to growing our new monthly giving community, The Spring. Today, the average American has 11 subscriptions — things like cable, internet, music, movies and newspapers or magazines. So we applied this subscription model and tapped our unique 100% model to create a unique giving program. The average contribution is $30 a month, and we currently have 33,000 members across the globe who are collectively helping us bring clean water to almost 4,000 people every single day. I feel strongly that this community is going to be the key to helping us solve the water crisis, so I spend most of my time thinking about how we can make the program more exciting and unique from any other monthly giving program. We’re also spending more time looking beyond ourselves. What impact are we having beyond just people served? How will we continue to reinvent charity and use the lessons we’re learning to serve others who are doing important work? It’s my hope that my book ‘Thirst’ will help inspire some of that thinking in others, and even be a catalyst and a useful tool for the next generation of social entrepreneurs.